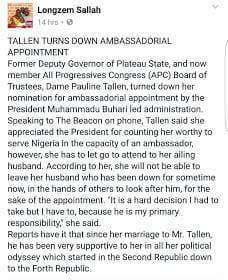 One one the ambassador nominee by President Buhari has turn down the offer so she can take care of her ailing husband. People who have not seen money before, family means nothing to them. If you've seen money, you know it's true worth and you are not a greedy fellow, then family will come first in all things. Kudos to this good wife!